If possible, when I go to eastern Nebraska (Nebraska City, at the far eastern edge Nebraska near the Missouri River) on a visit, afterwards, I try to dip down and return through central Kansas. That is what I once again did this past week. Leaving Nebraska City and stopping off at Holton, Kansas, from where a life long friend’s family hails, I wind up for a few relaxing – and always intellectually stimulating – few days with Margy Stewart and Ron Young at their Bird Runner Wild Life Refuge on Lower McDowell Creek, south of Exit 307 on I-70 ten miles east of Junction City. On route to Denver again, I find it difficult to bypass the small town Wilson, Kansas, whose welcome sign claims it to be the “Czech Capitol of Kansas” and whose sole grocery story offers the best hometown made sausage available in these parts, and for the most reasonable prices. Then it’s off east of Wilson to Hays, Kansas for what is one of the great thrills of the whole trip: a visit to the Sternberg Museum of Natural History. The Sternberg is best known, among paleontologists, at least, for its extraordinary collection of what are referred to as “Kansas Cretaceous marine life” and specifically, the wonderfully preserved “fish-within-a-fish.” “Gillicus” is the six-foot long fish swallowed by the fourteen foot Xiphactinus some 70 million years ago. The suggestions are that while Xiphactinus was able to swallow Gillicus whole, no small feat for the ancient glutton, that the experience killed him, a prehistoric example of biting off more than you can chew. The extraordinarily well perserved fossilized skeletal remains of both predator and victim locked in a lethal display. For those interested enough, this fossil is just a gateway to a long-lost world. As with most other museums, what is displayed is a small, if not tiny part of a much larger collection. In the Sternberg’s case, those displayed for viewing are a sliver of the museum’s 3,750,000 specimen collection. For those of you unfamiliar with the language of geological historical slices of time, don’t let words like “Cretaceous” scare you away. “Cretaceous” refers to a geological period beginning at about 145 million years ago extending to 66 million years past. The climate during this time was generally warm, with rising sea levels. The oceans and seas were populated with now extinct marine reptiles, ammonites and what are referred to as rudists; on the land this was the age of the dinosaurs while new species of mammals, birds and flowering plants came on the scene. The Cretaceous itself is a part of “an era”, – a longer geologic stretch of time, known as the “Mesozoic.” These geological “periods” and “epochs” were first clearly delineated in the early 19th century by a number of scientists (Lyell and others), and with modern dating methods (tree ring, radio-active carbon ), scientists have been able to put very accurate dates on these timelines. The Cretaceous ends around 66 million years ago and is marked by what is referred to as the KT boundary. At that moment 66 million years back, a dramatic shift took place for life on earth that affected the planet. It is at that time that a large number of species went extinct – most well-known of which are the dinosaurs, that went the way of all flesh suddenly and forever after a long – 80 to 100 million year – run. Slam, bam – they’re gone. Less known is a whole variety of “mega” maritime life (“mega” – meaning very, very large – big dinosaur sized) that were to the oceans what Tyrannosaurus Rex, Stegosaurus and Triceratops were to the land. Others left the scene suddenly too. Looking at the geological record, scholars have come to conclude that at that 66 million year ago moment, the world had experienced the fifth of a series of “mass extinctions”. One of these earlier mass extinctions, referred to as the Great Permian Crash, some 248 million years ago, is estimated to have wiped out some 96% of all living things. In the Cretaceous ending case of the KT boundary 66 million years ago, for a long time it was unclear what might have caused such a sudden catastrophe, until in 1981, Luis and Walter Alvarez suggested it was the result of a giant asteroid fell in the Yucatán Peninsula, at Chicxulub, Mexico. It changed the earth’s atmosphere producing a dust cloud that kept out the sun, spiked global temperatures changing climatic conditions and killed off much of life on earth. Looked upon skeptically at first, with time, the hypothesis has gained strength and credibility as KT boundary layers have been discovered in many rock formations worldwide. As recently as 2010, a world conference of scientists endorsed the Alvarez hypothesis which is generally accepted as the cause of the dinosaur extinction. The other animals that died out at the same time where the maritime mega-forms, as oxygen levels and water temperatures also plummeted. 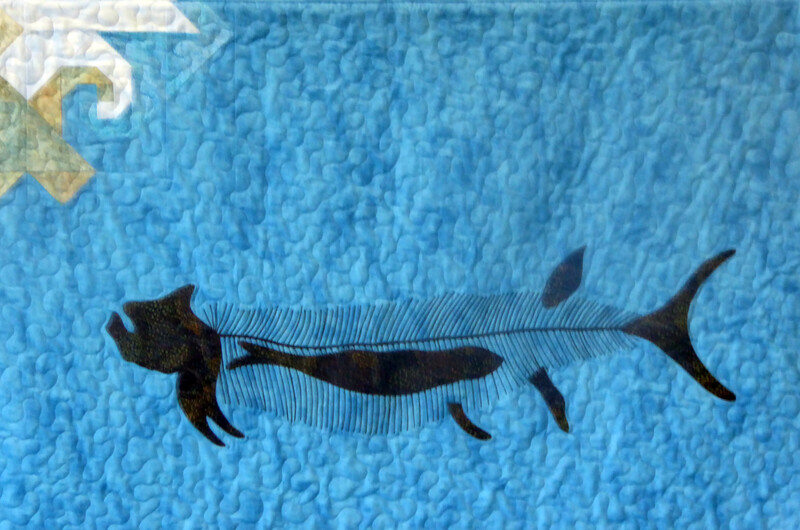 Many of these long-lost maritime species roamed the seas of Kansas (yes, that is not a mistake) and the fossilized remains of many of them have been continually uncovered over the course of the past 150 years throughout, especially, the western parts of Kansas. Although it might goose the state’s influential – and increasingly wacko – Christian fundamentalists, the Kansas of today is quite different from its appearance 100-80 million years ago, that geological period known as the “late Cretaceous”. It was entirely under water as was much of the Great Plains. 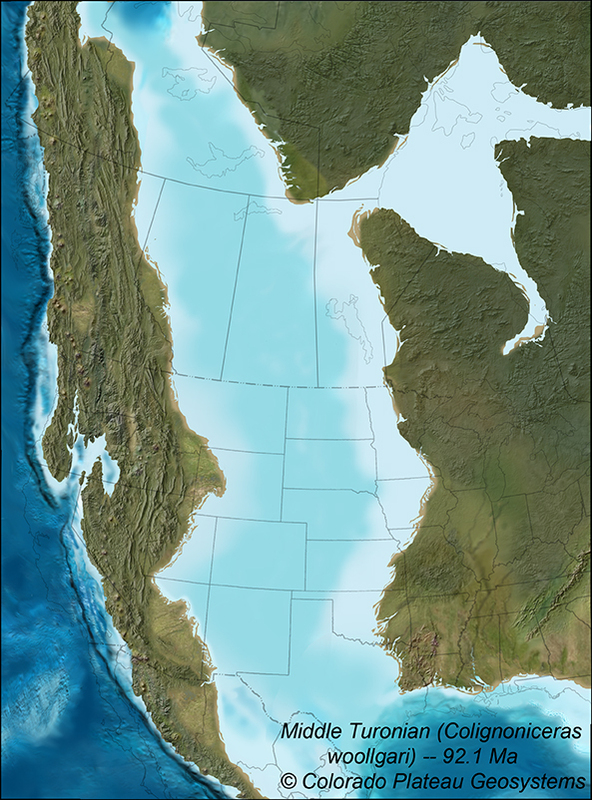 In fact what today is the Eastern United States was separated from West by what was known as the Cretaceous Interior Seaway that split the North American continent in two (and sometimes in three) sections). At its largest, it was 2,500 feet (760 m) deep, 600 miles (970 km) wide and over 2,000 miles (3,200 km) long. Its seashores fluctuated overtime, but through most of its long history what is today the state of Kansas, as well as much of the West up to the edge of the Sierra Nevada Mountains in eastern California was under water. The current generally flat-ish landscape of this region in western Kansas and the high plains of eastern Colorado was, 100 million years back, the bottom of the sea and one can still see not far from the surface in many places large quantities of the sand that made up the sea bottom. 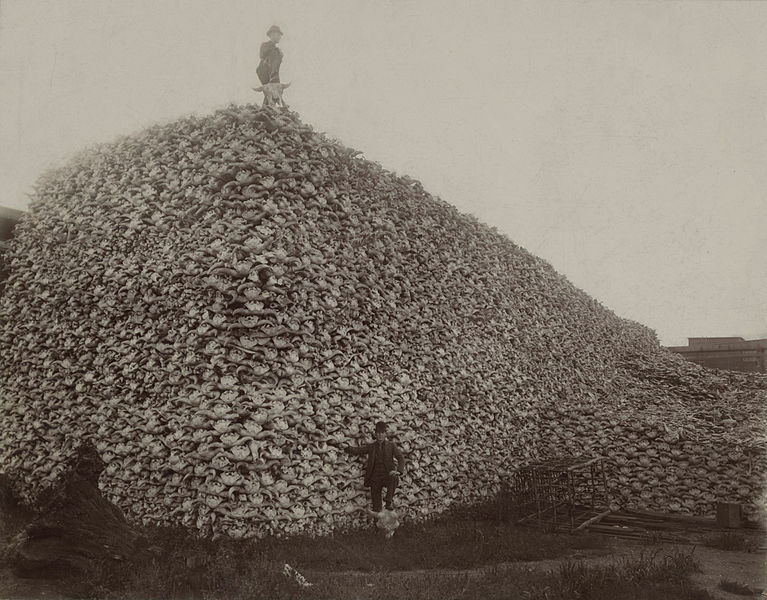 The period of western expansion and development after the end of the American Civil War was marked by intense economic and political developments, “the closing of the frontier,” the decimation of the buffalo, and the wiping out of the last remnants of independent Native American culture (from the Sand Creek Massacre in 1865 to the Wounded Knee slaughter in 1890). It was in this period between the end of the Civil War and 1900 approximately that western regions of the United States from the Missouri River to eastern California were more intensively probed, settled and economically exploited. Fossil hunting along with archaeological discoveries, such as the discovery and excavation of the Mesa Verde Anasazi site in SW Colorado were an integral part of the period. Hunting for the bones of dinosaurs of all sizes and shapes in the western regions – but especially Colorado, Wyoming and Western Nebraska intensified and was followed with some excitement in the national press. In these regions O.C. Marsh from Yale University in New Haven Connecticut and E.D. Cope of the American Philosophical Society in Philadelphia engaged in what became known as the “Bone Wars” in which each tried to discredit each other in the press the others discoveries, destroy each other’s discoveries with each claiming that their most recent dinosaur discovery outdid their competitors in evolutionary significance, a classic example of the utter stupidity of academic competition setting the stage for the future, although in the process, the two did make a significant number of dinosaur (and other) fossil discoveries, most of which had to be re-interpreted later by more sober analysts. Dr. George M. Sternberg, renowned Civil War surgeon and later Surgeon General of the United States Army, was assigned to Fort Harker (Fort Ellsworth), Kansas in 1866. While stationed in Kansas, Dr. Sternberg often visited poss along the Smoky Hill Trail. During his travels, Sternberg helped to identify fossil bones that had been found by soldiers on patrol in western Kansas. Sternberg would stay in the region for the rest of his life and continued fossil collecting. Unlike Cope and Marsh whose collecting passions centered around “trophy fossils” and the press attention they garnered, Sternberg became interested in collecting fossil leaves found in the sandstone hills near his home. Many of these specimens are now a part of collections worldwide. George Sternberg passed on his interest in fossil collecting to his sons, George F., Levi and Charles M. At the tender age of 9 George F. had already made a major discovery, a fossil reptile called a plesiasaur, a giant carnivorous marine reptile, a kind of tyrannosaurus-rex of the seas. In 1952, George discovered the famous “fish-within-a-fish,” discussed above, the most complete specimen of its kind known. The museum in Hays, Kansas where Sternberg did much of his work was renamed in his honor after his 1969 death. the quilted version of Xiphactus swallowing Gillipus in the museum lobby.